Recently, I was contacted by Saucy Mama about entering a recipe in a cooking contest they are hosting. Other than the Foodie Joust & Iron Cupcake, I've never entered a recipe in a cooking contest so I thought why not plus there were some great prizes including a Kindle. They sent me a lovely assortment of their marinades, dressings & sauces to play with. I have to say we were impressed to see the ingredients in all of there products, it was all things we recognized instead of a bunch of chemicals. We were most drawn to the Lime Chipotle Marinade & it made me think of the Caribbean & then I thought of pork...pulled pork. Saucy Mama was looking for recipes that were quick & easy for a family to prepare. Well, you can't get much easier than cooking in a crock pot. Throw everything in, walk away & hours later dinner is done. As for quick the hands on time on this recipe is no more than 10 minutes. This made for such a tasty sandwich! Just a hint of spice (the perfect amount for a wimp like me) & a freshness from the lime. The meat was super juicy. I liked mine just plain on a roll while Matt topped his with some coleslaw & a slather of Saucy Mama's Chipotle Mustard for an extra kick. For a quick side dish we roasted some potatoes with the Chipotle Mustard. They got crispy & had a gorgeous color. Everything was served up with some steamed beans for a really easy statisfying meal. Want to try making this dish yourself? Well I have four bottles of Saucy Mama's Lime Chipotle Marinade to give away. Leave a comment on this post & I'll pick four random winners on Thursday, August 13th. Please leave your email address in your comment so I can contact you. if you win! Sorry, I can only ship to the US and Canada. With a slotted spoon take the meat from the crock pot & put into a bowl. Use a fork to shred the pork. Stir in 2 tablespoons of the Lime Chipotle Marinade and the lime juice. Mix everything together in a roasting pan. Place in oven and let roast to 30 minutes until browning. Wow! This looks like a delicious way to spice up the usual BBQ pulled pork! Pulled pork...one of foods best gifts to the belly. I could eat 3 of these sandwiches (then wear elastic pants). Oooh, I could have used this recipe and the sauce yesterday! 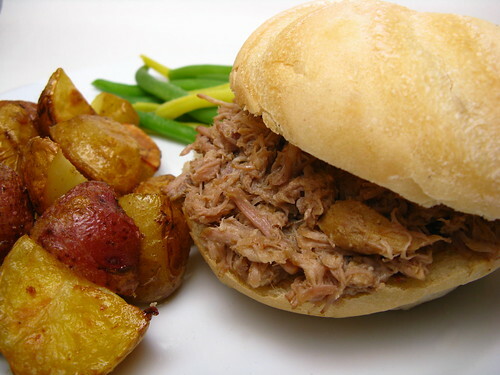 We had chopped pork sandwiches and roasted potato salad with mustard dressing. Yum! I love a good pulled pork sandwich any day of the week. Sounds like a great flavor combo...and you had me at "juicy". Mmmmm. drooling! i'd love to make this. Looks awesome. I am going to check out their site. Mhhmmm... lime & chipotle... some of my favorite flavors! the meal sounds delicious! Yum! This looks so good. I tend to use the crock pot more in the fall/winter, but I should use it more this time of year because it doesn't heat up the kitchen, and you still get those wonderful aromas. it seems that i'm currently obsessed with lime, and this is a truly unique and fantastic application for it! the pig looks excellent, and the taters ain't too shabby either! What an easy and delicious sandwich! I agree that pulled pork is one of those miracle dishes that always tastes good without much effort. Mmm beer and lime. Michelada pork? That marinade sounds like a winner and the sandwiches couldn't look better. 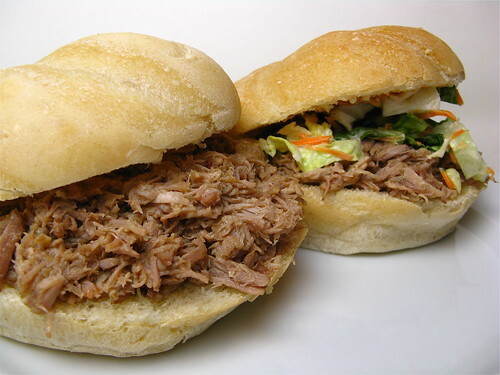 I love pulled pork like that, nice and lean. Glad to hear about those ingredients. I will keep my eye out for this one. Just caught those Milan cookies as well. Those may be making an appearance on my Christmas cookie list this year. Yum! This is the second post I see with that chipotle mustard in less than an hour. Now I want to try it! LOL The sandwiches sound delicious. A great spin on pulled pork and I love adding slaw to mine as well. Yum. I'll have to try and find some of that marinade! I really need a crock-pot! There is nothing like a good moist pulled pork, and what could be better than pulled pork with a spicy southwestern-y kick! Love this great way to make the pork! Pulled pork....drooll....first thing I thought of when I read lime and chipotle was damn great combo for pulled pork. It sounds really intriguing. Thanks for the chance. I am entering the contest as well, but I don't know what I'm making yet! This sounds wonderful! Sounds wonderful! (Is it lunch time yet?) Id top mine with some mango salsa...mmmmmmm! Thank goodness for Twitter - I missed this post!! Thank goodness you tweeted this, cause this sandwich it too good to miss! I love me a pulled pork sandwich and wish I had a crockpot to make some in. I love just about anything with pork and this looks incredible! I've been checking in at your blog for a while now and always appreciate the easy-going presentation of your recipes and the way that you share your experiments - the good and the bad. It is definitely inspiring to a beginning cook like me! I've actually just begun considering signing up for a local CSA in my area. So anyway, thanks for your commitment to sharing these things through your blog!